I have made the point that the reason behind my Yolande shape is that I want to drive the guitar top from the centre to achieve a particular sound. But where’s the evidence? One way to show the difference between driving the top at the centre compared to the edge is to analyse the tap tones you get from doing just that. the treble response from about 400 to 1000Hz is stronger for the edge tap. The first peak is the low, boomy air body response. If you do this test on your own guitar – even if you don’t analyse it the way I have – you’ll be able to hear the difference. The edge will give you a slightly higher, thinner tone compared to the boomier centre tap. So that sets the stage for an answer to why I design the way I do. The next chart compares the response of one of my Parlour 6 guitars with a similarly-sized Martin 000-18 which has the bridge in the usual position for a dreadnought-shaped body, closer to the soundhole. 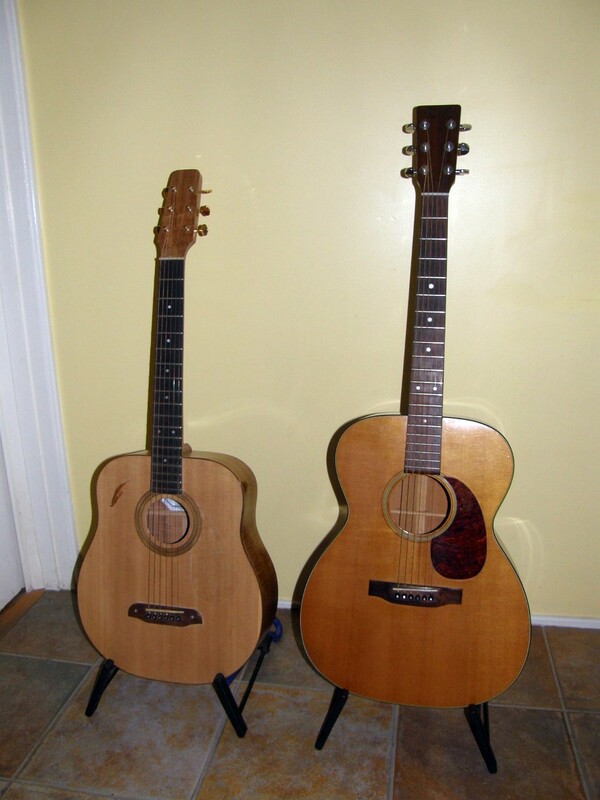 The one on the right is the Martin, a lovely guitar. I tapped them each on the bridge where the strings cross the saddle. Keep in mind that this is not the best one-to-one comparison because of the other differences between the guitars (different top bracing, different-sized soundhole etc). I tried to make the taps as equal as possible. What’s remarkable is firstly the similarity of form between the two signatures – that’s because they’re both guitars. It’s the differences that are interesting, though. The first peak – the airbody resonance – is slightly better for the Parlour 6, as well as occurring at a higher frequency because the airbody is a bit smaller than the Martin’s. From about 220Hz upwards, the Martin’s response is consistently stronger, and this corresponds to a very bright but slightly thinner sound. The Parlour’s tone is, for want of a better way to describe it, more like a smooth red wine compared to the Martin’s cheeky white. Both tasty, but definitely different. You can see how the strength of the tap is important for this kind of comparison. Had I tapped the Martin less strongly, the form of the response would be the same but it might fall lower than the Parlour – or vice versa. This entry was posted in Guitar design, Sound spectrum and tagged Jumbo, Martin, Parlour, tap comparisons on April 23, 2013 by Michael Williams.